Over the next several hundred pages, our hero stumbles from one adventure to the next. His stint as a hotdog vendor is less than successful, and he soon turns his employers at the Levy Pants Company on their heads. Ignatius's path through the working world is populated by marvelous secondary characters: the stripper Darlene and her talented cockatoo; the septuagenarian secretary Miss Trixie, whose desperate attempts to retire are constantly, comically thwarted; gay blade Dorian Greene; sinister Miss Lee, proprietor of the Night of Joy nightclub; and Myrna Minkoff, the girl Ignatius loves to hate. The many subplots that weave through A Confederacy of Dunces are as complicated as anything you'll find in a Dickens novel, and just as beautifully tied together in the end. But it is Ignatius--selfish, domineering, and deluded, tragic and comic and larger than life--who carries the story. He is a modern-day Quixote beset by giants of the modern age. His fragility cracks the shell of comic bluster, revealing a deep streak of melancholy beneath the antic humor. John Kennedy Toole committed suicide in 1969 and never saw the publication of his novel. 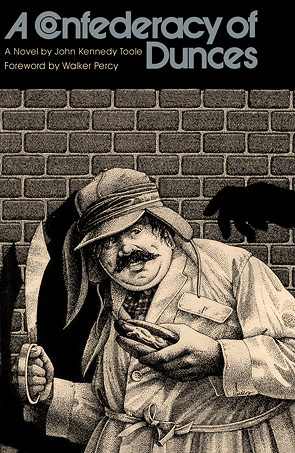 Ignatius Reilly is what he left behind, a fitting memorial to a talented and tormented man.